“A splendid anthology”. (The Times). No writer knew better than PG Wodehouse how a drink can lift the spirits – and he was a master at the high comic effects of having a few too many. 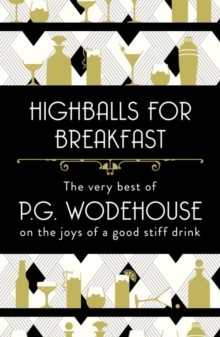 Highballs for Breakfast is a handpicked selection of wit, wisdom and comic moments from Wodehouse’s work that involve getting pickled or plastered, or lathered or sozzled, and getting in and out of all manner of scrapes. If some great writers dwelled on the darker side of drinking, Wodehouse was concerned with the pure pleasure to be had from ‘the magic bottle’ and getting outside of the contents of a tall glass. His imperishable writing displays a well-turned appreciation for all kinds of booze – cocktails, champagne, port, whiskey and brandy (with soda, of course); but also the humble pint, and even the infamous poteen. This sparkling collection captures Wodehouse at his best on being terribly thirsty, or drowning one’s sorrows, or knocking one back for Dutch courage. It finds him celebrating the special atmospheres of the English country pub and the Manhattan barroom. And it shows him to be exceptionally good on hangovers, but equally so on hangover cures, such as the legendary pick-me-ups prepared for Bertie Wooster by the dependable Jeeves. For all lovers of a laugh and a drink, Highballs for Breakfast is a tonic, a bracer, and a tissue-restorer.